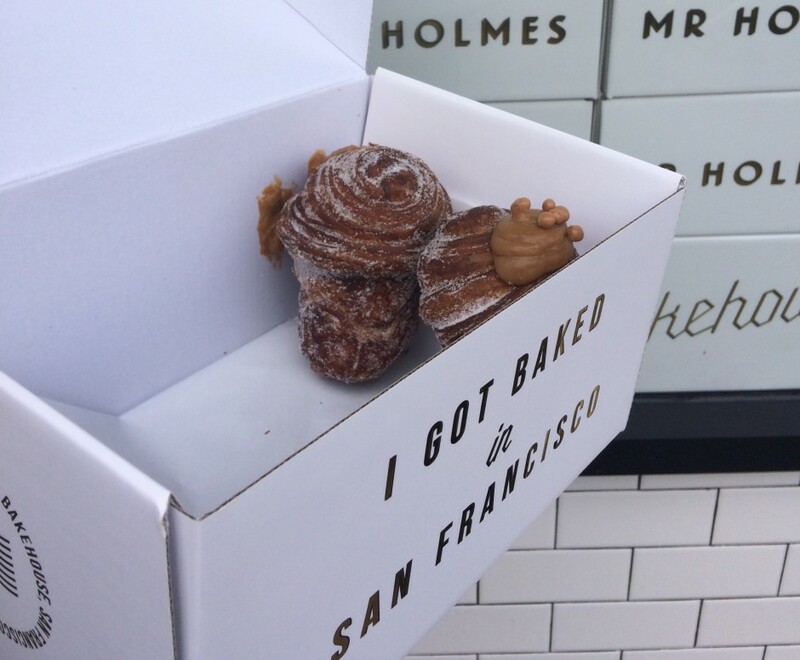 Since it’s opening in November 2014, Mr. Holmes Bakeshop has induced cruffin enthusiasts from across the city to form lines around the block at the crack of dawn each morning in anticipation of acquiring a cruffin from the limited daily supply. As much as I’ve wanted to try this infamous cruffin, the long lines deterred me on multiple occasions. However, I finally made up my mind that the cruffin would be mine! After gathering tips from multiple friends who have acquired a cruffin in the past, I learned that despite the shop opening at 7am on weekdays and 8am on weekends, cruffins don’t make an appearance until 9am. So on a Sunday morning I headed to Mr. Holmes at precisely 9am and was surprised to find that the cruffin line weaving out the left side of the store (yes there’s a line dedicated for just the cruffin-buyers) was not as long as I had expected. After waiting a short 15 minutes, I had acquired two of my very own salted caramel coffee cruffins! I took my prized possession to the other line where I waited to add more pastry goodies to my order. A blackberry white chocolate donut, cornflake cookie, blueberry french toast, and churro croissant also made their way into my box. After paying I made my way outside where I immediately dug into the box of assorted sugary goodness. 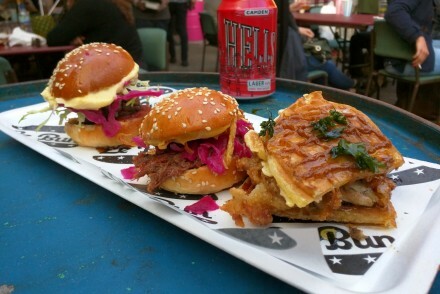 The short answer: Yes this place truly is that ridiculously delicious! Salted Caramel Coffee Cruffins: The buttery flakes of goodness and soft inside with delicious salted caramel cream overflowing out are sure to delight your taste buds! 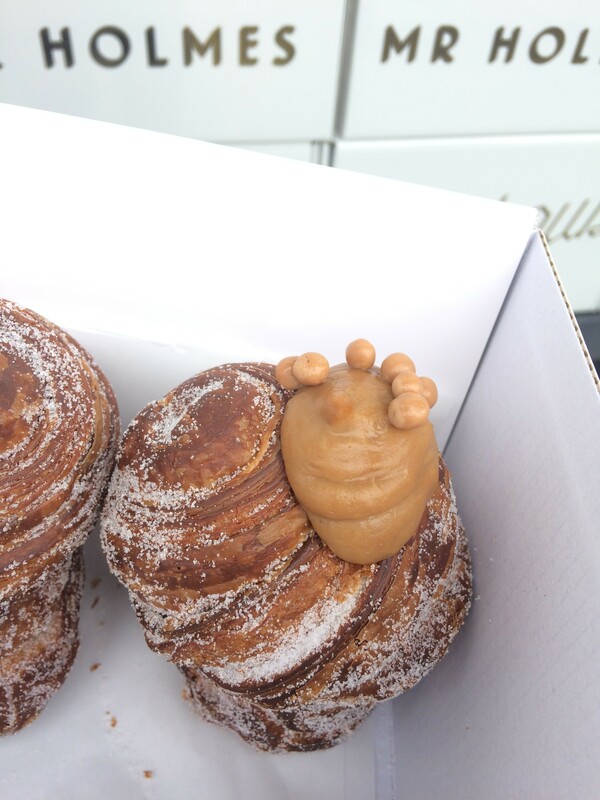 I was dancing in happiness as I savored each bite of my first ever cruffin! Blackberry White Chocolate Donut: The donut was a bit heavy, and while the cream inside was flavorful, it was a bit too sweet. This was my least favorite of the assortment. Cornflake Cookie: As a huge fan of the crunchy cornflake goodness I had to try this cookie and it did not disappoint. A combination of sticky brown butter toffee and crunchy cornflakes makes this treat heaven in my mouth! Blueberry French Toast: Tart blueberries balanced out the crusty, butter french toast bread. Not too sweet, extremely flavorful and the perfect texture. Churro Croissant: Covered in cinnamon sugar and filled with dulche de leche cream this is the perfect mixture of light sweetness to a flakey croissant. A lot of sugar? Most definitely. Probably too much in one sitting. But I had to make up for all the times I’ve walked away from the shop due to the long lines around the block by trying a few items! All in all, Mr. Holmes Bakeshop is worthy of all the hype! If you can go on a weekday that’ll be your best bet for shorter lines. 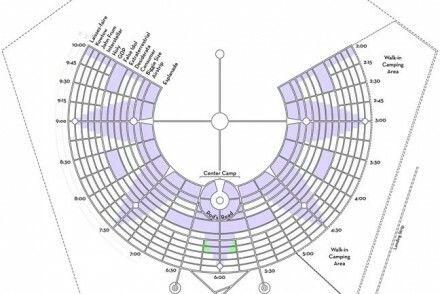 Arrive between 8-9AM (depending on how risky you’re feeling!). Cruffins won’t make an appearance until 9AM. If you’re willing to take the risk show up at 9AM right when the cruffins arrive and if you’re lucky, you’ll be just in time to avoid an hour wait while getting your hands on the last few cruffins! There’s a 2 cruffin per customer limit. If you want to purchase more, bring a friend. Speaking of bringing a friend, I’d highly recommended that you bring a friend! That way you can buy more goodies and taste test them together. Plus while you wait in the cruffin line, your friend can purchase the other pastries and/or coffee from the second line. Boxes are only free if you purchase 6+ baked goods otherwise you’ll have to pay for the box or take your pastries to go in small paper bags. Have plenty of napkins on hand. Most of the pastries are dusted with sugar and flakey guaranteeing a messy face after a few bites! Savor in the moment of cruffin heaven.